SciFi has been promising robots in the home since the 50's. Android beings in different shapes and sizes capable of different tasks around the home whilst you lounge out in the garden with a drink in hand admiring the freshly cut lawn which your home robot cut a little earlier. That utopian view of life with robotics had the shine taken off it as the decades rolled by and we realised that we are still some way from making robots that can perform these tasks. As the decades rolled on and artificial intelligence, A.I., became a reality the robots took on a more sinister persona in our psyche as we started to imagine these robots becoming far superior beings to us and taking over the world! And so, we were no longer so keen to have a robot living in the house with us. Things have moved on again, and we are now on the cusp of at least realising some of the ambitions we had in the 50's, of a helpful, kind and easy to manage robotic helper to free up our time to do more of the things we enjoy. 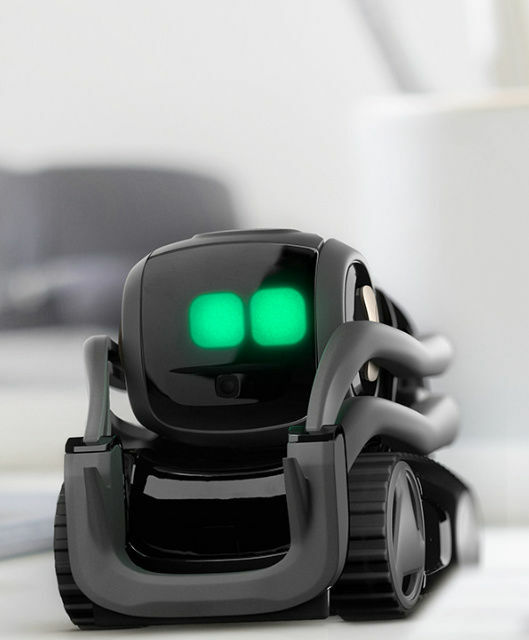 Meet Vector, the little cute home robot who will soon become a big part of the family. Vector is always happy to see you, even when he is feeling a little grumpy. He is always eager to help any way he can. Of course he can do all the things Amazon's Alexa and Google Home can and so much more beyond. Before you know it this little chappy will be part of the family. One of the first home robotics that looks like it really could have some value to the end user and no doubt we can expect a lot more, and cleverer, robots in the next year or two from other manufacturers and it won't be long before having an intelligent, AI driven robot in your home, that can actually help in different areas of your life, is no longer the stuff of dreams or sci-fi movies.